ISLAMABAD: November 11, 2018: Senior Superintendent of Police (Operations) Waqar Uddin Syed has directed all police officials to follow merit policy in true letter and spirit during their professional tasks and take strict action against those illegally occupying the properties of others and involved in drugpeddling activities. He made these directions while chairing a meeting here at Rescue 15 which was attended among others by all Zonal SPs, SP (Investigation), all SDPOS and SHOs. 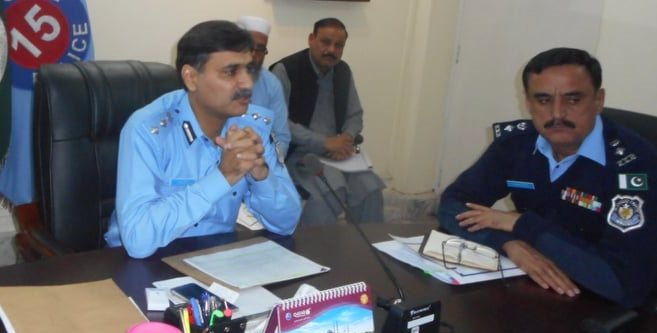 Following directions of IGP Islamabad Muhammad Aamir Zulfiqar Khan for strict action against land mafia, SSP (Operations) said that no sluggish attitude would be tolerated against landmafia and other criminal elements. He ordered for effective policing measures against drug pushers and curb such practices through professional attitude and commitment. He said that corruption would not be tolerated in the force and those black sheep involved in it would be shown door. He directed to listen complaints of citizens, fix timings and remain in contact with them on regular basis to inform them about development in their matters. He also asked for briefing ad checking of performance of investigation officers on regular basis and strict action against those involved in sluggish policing. The SSP directed all police officials to improve their performance by effectively combating crime and ensure arrest of proclaimed offenders at earliest. He directed police officials to take effective steps to control crime and adopt a professional as well as responsible attitude to mitigate the sufferings of the people. He also directed for effective measures against those involved in drug peddling activities and curb such practices in educational institutions. He categorically asked all police officials to focus on resolving the public complaints and take every possible step to provide maximum relief to citizens. Mr. Waqar Uddin Syed stressed for speedy disposal of cases and their investigation purely on merit. He said that investigation on pending cases should be completed at earliest as progress on such cases would be reviewed. The SSP asked for objective patrolling measures in the city and to assign duties to policemen after holding crime meetings. Special teams should be constituted to curbdrug pushing activities, he said adding that no laxity would be tolerated in this regard.